You’re ready to pop the question to that special someone, but first, you have to decide on a ring. 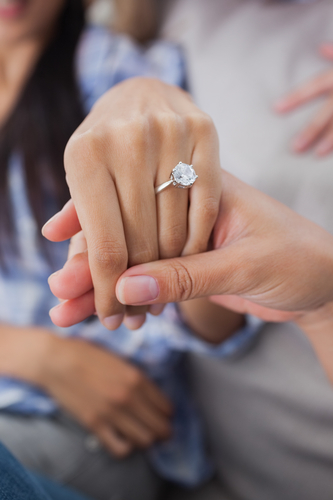 Shopping for engagement rings can be overwhelming, but the experienced staff at Cleves and Lonnemann Jewelers in Bellevue, KY, are happy to provide their expert guidance and assistance. With 84 years in the business, they certainly know engagement rings. One of the first considerations is your budget. Typically, the recommendation is that you should spend two month’s salary, but you know your finances best. Once you pin down a range, you’ll have a better idea of the options available to you. Prong: The most common setting is a three to six clawed prong option that holds the stone in a metal “basket.” This setting is popular because it showcases the diamond by allowing the most light exposure. It holds a stone securely and is easy to clean, but it can snag on clothing. Bezel: This thin metal band setting surrounds the full perimeter of a stone and provides a very secure enclosure. It doesn’t let as much light shine through as a prong setting does. Tension: The stone in this setting is held in place with the tension of the ring, giving the illusion that the stone is floating. The diamond isn’t as well protected in this setting and resizing is very difficult. Pavé: This setting is paved with smaller diamonds next to one another to create an impressive series of stones and a ring with extra sparkle. Resizing may be difficult if the ring is fully paved all the way around. With these guidelines in mind, you’ll be well on your way to selecting the perfect option. Cleves and Lonnemann Jewelers can answer any questions you may have about diamonds and settings. Call them today at (859) 261-3636 or visit them online for more information about their engagement rings.